The Ferrari 458 Challenge, the latest Maranello road car to racecar transformation, has just been revealed at the Annual Dealer Meeting. Of course, the Challenge version is heavily based on the already mighty 458 Italia, which has been drawing praise the world over since its launch. To make the 458 that little bit better on the track Ferrari’s engineers have played with the gear ratios to offer more low down torque, even though the road car’s standard engine and 425kW remains. The E-diff from the standard car also makes its way onto the Challenge meaning it is the first Ferrari wearing this badge to be fitted with such technology. Similarly, the most recent traction control technology from Ferrari, F1-Trac, has also been fitted to a Challenge for the first time. A weight loss program has been employed through the use of thinner body panels. Other lightweight materials such as carbon fibre and lexan have been used as well. 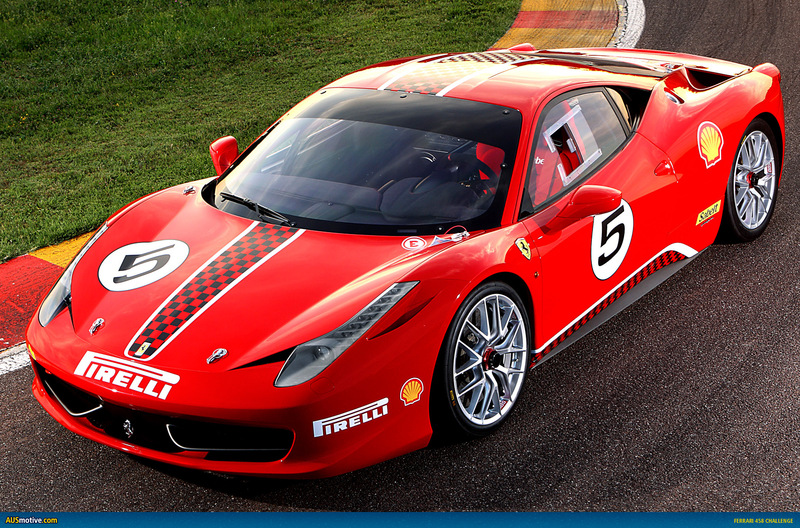 The Challenge sits 30mm lower than the Italia and runs on 19″ alloys with Pirelli slicks. Apparently prospective 458 Challenge owners are “professional and gentlemen drivers alike” and they’ll be pleased to know they will be able to race their new toys in the Ferrari Challenge Trofeo Pirelli series from 2011. They also have a new target time of 1:16.5 at Ferrari’s Fiorano test track; two seconds faster than the F430 Challenge. Maranello, July 14th 2010 – The 458 Challenge has made its world premiere debut in Maranello during the Annual Dealer Meeting, a traditional event that brings together the representatives of Ferrari’s international sales network. The new 458 Challenge also has a specific suspension set-up with solid aluminium bushings, stiffer springs, single-rate dampers, centre-nut 19” racing rims, larger dimension Pirelli slicks and a ride height lowered by 30mm all round. It is also equipped with the new generation Brembo CCM2 brakes which debuted on the 599XX, Ferrari’s extreme experimental laboratory car, and which are integrated with an ABS system that features two configurations – low grip and high performance for dry surfaces. Another first for a Ferrari Challenge model is the adoption of the F1-Trac traction control system, the most sophisticated of its kind. Developed in-house by Ferrari, the F1-Trac system constantly monitors levels of grip for maximum high-performance road-holding. 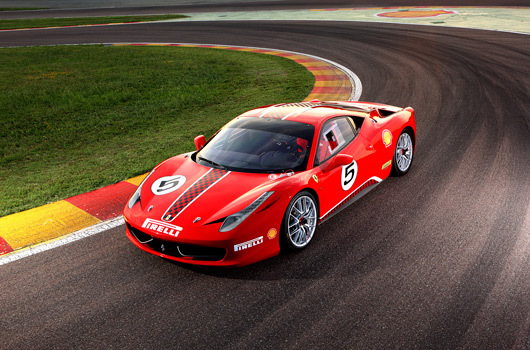 Two specific track-biased calibrations – wet and dry – have been developed for this application, with control logic and strategies derived from Ferrari’s extensive racing experience in the F1 and GT championships. The F1-Trac is completely integrated with the E-Diff to guarantee maximum acceleration out of corners.